The changes in Japanese society, accelerated during the war with Russia (1904-5) became really profound during WWI. There was an economic “war-boom” between 1915 and 1920, and in twenty years’ time Japan was transformed from an essentially agricultural society into an industrial one. In 1895 12% of the population lived in the cities, whereas in 1920 more than half lived there. Japan had become an urban society. Different standards of living developed: urban vs. agricultural, but also rich vs. poor. In both cases the differences were huge. Japan had become a capitalist society, where the poor masses were exploited and the rich became richer and more powerful every year. The poor did not take all this situation lying down: in 1918 there were rice riots because the price of rice had quadrupled in ten years’ time (and the wages had not!). The power exercised by the government was so big and efficient that the example of the Russian Revolution couldn’t be followed, although all the ingredients for a revolution were there in abundance. An example of the government’s efficiency was that just enough reforms were implemented to keep revolution at bay. Japan’s growing power and influence met with a lot of resistance abroad. For Japan it was very difficult to be accepted as a major player in international politics: during the Versailles conference at the end of WWI Japan failed to obtain the Racial Equality Clause in the Covenant of th League of Nations. Japan’s growing influence in Korea and in the Chinese mainland was resented and obstructed wherever and whenever possible. Japan became more modern every year, but its problems grew proportionally as well. This decade also witnessed the death of the Meiji emperor (on July 30th 1912), and the start of a new era, the Taishô (Great Righteousness) era, which would last until 1926. 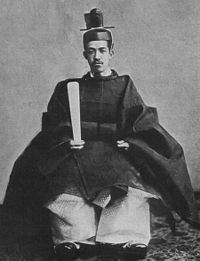 The Taishô era is often seen as a kind of Golden Age, comparable to the Roaring Twenties in the West. It is true to a certain extent, especially with respect to art and culture. A cynical comment might be that the rich are always well-off, in whatever era they live. This decade of course witnessed the birth of Sôsaku Hanga as an art form. A lot of different factors and developments coincided: in 1910 a group of young intellectuals started the magazine Shirakaba (White birch), which continued publication until 1923; primarily a literary magazine it was also a meeting point for all people guided by idealism, individualism and liberalism. In the same year Minami Kunzô (1883-1950) returned from a period abroad, and undertook a series of woodblock prints, which he carved and printed himself. 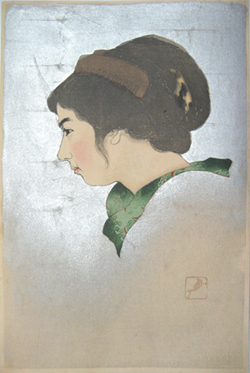 These were exhibited in 1911, and this was the first exhibition of “creative prints” ever held in Japan. In 1915 there was en exhibition of German Expressionism, mainly consisting of woodblock prints. It had a huge impact on all young Japanese artists. A few very young artists, Onchi Kôshirô (1891-1955), Fujimori Shizuo (1891-1943), Tanaka Kiyôkichi (1892-1915) had started the magazine Tsukubae in the previous year, while they were still students at the Tokyo Art School. The ranks of these talented artists had been joined by Tobari Kogan (1882-1927) and Takehisa Yumeji (1884-1934), who also made hanga in this decade. In 1916 Ishii Hakutei (1882-1952) and various other artists of the Hôsun group started with an ambitious project, Nihon fûkei hanga (Japanese landscape prints), consisting of 10 sets of 5 prints each, which were published beteen January 1917 and April 1920. Then, in June 1918, the Nihon Sôsaku-Hanga Kyôkai (Japan Creative Print Association) was founded by Yamamoto Kanae, Tobari Kogan, Oda Kazuma and Terasaki Takeo. In the following year an exhibition of 189 works was held in the Mitsukoshi department store, which was very successful. Since the first exhibition of Minami Kunzô’s work in 1911 only eight years had passed, and in that short period Sôsaku Hanga had established itself as an art form, and woodblock prints were no longer looked upon as simply a means of reproduction, performed by a skilled craftsman. However, among the artists there were differences of opinion from the start: one of the points of disagreement was if an artist had to personally perform all the steps necessary for the production of a print: making the design, carving the block(s) and making the print. Some of the early pioneers thought it quite acceptable to use professional printers and block carvers when it suited them. This issue was never completely resolved. The orthodox, purist view that an artist was responsible for the entire print process was often abandoned, both before and after WWII.